If Matt Doughty of Onell Design was a friend (or at least associate) of yours, you may have seen sketches or sculpts for the Venjorun Armorvor over the last couple of years-- he's had it on his phone, he's teased it on his blog, and he even let us preview it late last year. Since it's been at least a couple of years since I first saw it, I'm not only delighted that it finally made it out, but that it did so cheaply. It even has an alternate head-- the only thing it doesn't have is, sadly, a weapon. (Oddly, most of the figures from Onell Design come unarmed... or maybe that speaks volumes about our toys, culturally speaking.) 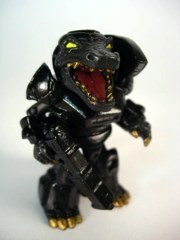 If Glyos figures like Pheyden were tributes to toys of the late 1970s and early 1980s, the Armorvor has to be late 1980s and early 1990s with its sharp lines, several V-like structures in the heads, and of course, the Black Core on its chest. They're apparently going to be here around the end of 2012! 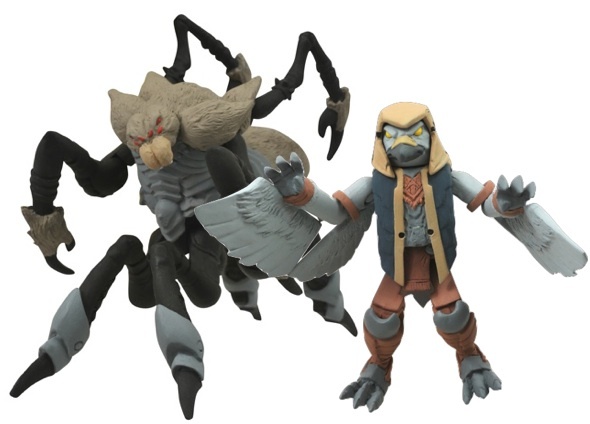 The long-awaited Battle Beasts Minimates will be solicited in Diamond's Previews come September, meaning preorders are just days away, folks! 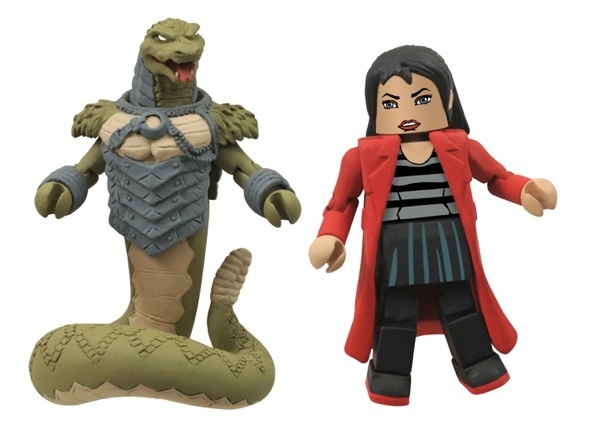 Specialty (read: comic book stores and the Internets) will be offered 4 different 2-packs in the first wave, including: Gruntos & Tate, Snake & Bliss, Tarantula & Merk, and Vorin & Scorpion. (Character names were not given for some of the animals at this time.) 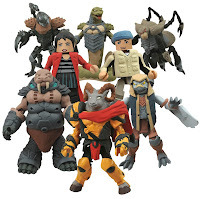 Tate and Bliss, the human figures from the IDW comic book series, are exclusive to specialty and Toys R Us will have different exclusive characters in their stead, plus variant deco from what I was told. The trio's good-natured powerhouse teams up with his newfound human compatriot! Well! I'm excited. More details will no doubt be coming soon-- weapons, for example-- but this is indeed good news for fans of all things Battle Beasts! 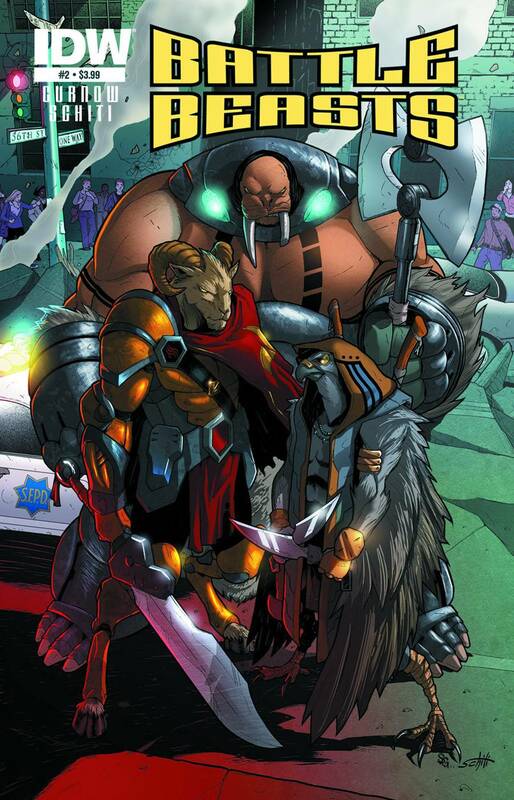 IDW published Battle Beasts #2 this week, and it should be at a comic book shop near you for $3.99. There's a variant cover, and the solicitation promises some new characters as well. Be sure to pick one up if you're out and about this weekend! 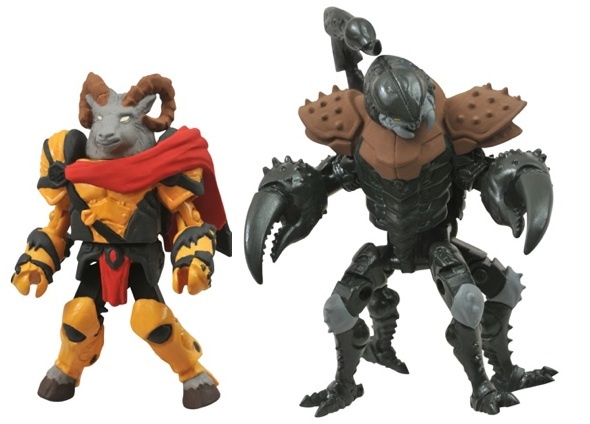 By now I hope you've seen our Battle Beasts Minimates Collectors' Checklist, the first of what will hopefully be a consistently updated look at the entire line from Diamond Select Toys. Modeled loosely after the graphic styling of older toy packaging, this shot shows the first 10 Minimates and where to get them. Well, assuming you have a time machine, as none of these ones are easily available now save for maybe Vorin & Zik from SDCC 2012. We hope you enjoy it, and if you have suggestions or requests for other resources for this toy line, do let us know! 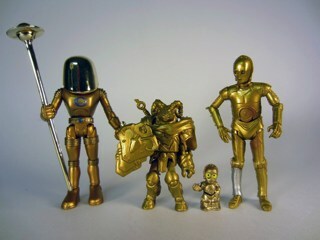 Since his mold was done first, it seems Gold Vorin is the go-to mold for exclusive Minimates this year. At Comic-Con 2012 in San Diego, blue clear figures were distributed to fans at the Diamond Select Toys booth and I'm not 100% sure everywhere this version ended up. There was an industry party for Heavy Metal Magazine (and others) which had some Battle Beasts involvement, and this was in the sack of goodies at the end of the night along with, awesomely, old Archie Teenage Mutant Ninja Turtles Adventures and Mighty Mutanimals comics. I loved those as a kid, but I digress. Gold Vorin! So far seemingly a party exclusive. If you're looking for a read today, and haven't seen it, Poe Ghostal has something for you! Interview > Diamond Select’s Zach Oat on Battle Beasts talks up some of the whys and whats, and even has a few words on that 2010 line of sculpted figures which has more or less gone away. (It's still not coming out.) Read on! Bad news-- it's issue #4 of 4! No word yet on if a sequel series is in the works, or if it's going to be a Transformers-esque "#80 of a 4-Issue Limited Series" kind of a gag, but this could be it. As such, be sure to pick up a copy when the potentially final issue hits stores later this year! Will Vorin get his groove back? Will Gruntos' pizza arrive before it gets cold? And will Merek find love in the city? Hopefully all this and more await us as the series concludes! 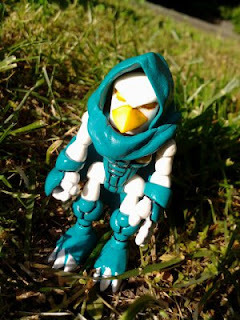 Cassette Man Studios produces a number of low-run and one-off custom figures, including a recent project based on Glyos bodies with new bird heads. 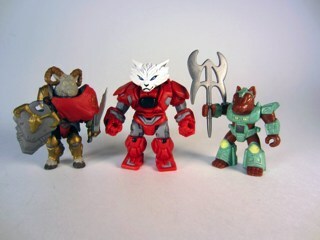 One of these is Battle Taa'lon (pictured), which recycles some existing parts and paints up the new ones to resemble the Battle Beasts Series 1 Colonel Bird. 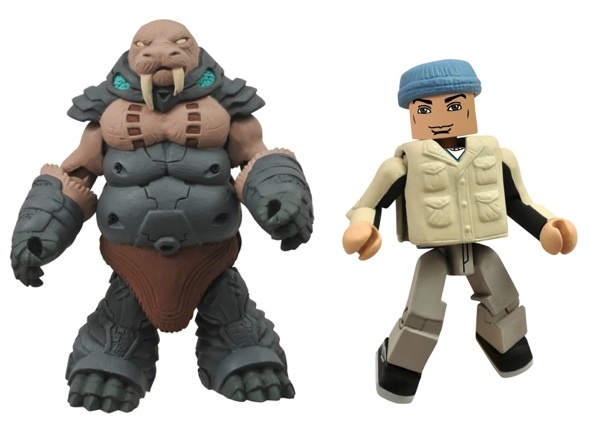 The creator is selling these 3-inch action figures at $40 per.